The NX 4™ is the newest member of the innovative ONYX™ platform from Obsidian Control Systems. Equipped with a range of professional features and using the latest in industrial components, the NX 4 is designed to handle even the largest show with ease. With a well-arranged combination of motorized and manual faders, as well as an array of playback buttons, the NX 4 offers 44 total playbacks in a compact yet extremely powerful package. Two independent playback sections offer instant access. The main playback with 10 motorized faders plus 10 play-pairs allow for quick page changes while the sub playback with 12 faders and 12 button playbacks mean that important cues are always at the your fingertips. The NX 4 houses a powerful new Intel Hexa-Core processor, high-speed NVMe SSD drive and 16GB of DDR4 RAM. Fast boot times, instant operation and the ability to process 64 Universes right inside the console without the need for costly external processing networks results in unprecedented power in this form factor. 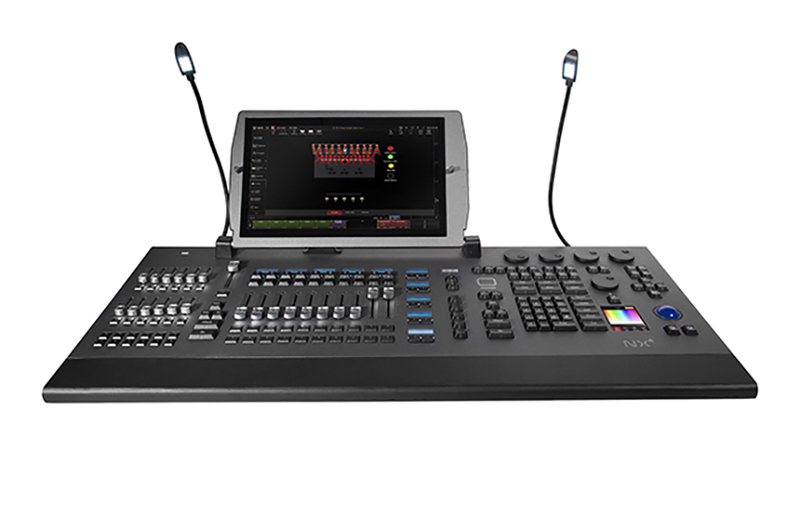 The NX 4 is also ergonomic with motorized playback faders, short depth, easy screen access, full ONYX command and keypad section, and bright, adjustable HD touch screen. With four DMX ports, Timecode, Midi and dual Gigabit ports for up to 64 Universes of Art-Net, sACN plus the ONYX X-Net protocol, the NX 4 has all the connectivity and power the ever-increasing sizes of shows demand. ONYX is a powerful yet easy-to-learn lighting control platform designed for both hardware consoles and PC systems. It is a rebranding of the well-established M-Series control platform and is designed for use with all new ONYX and existing M-Series hardware. Designed and maintained by real-user professionals with over 25 years of experience in lighting control systems, ONYX provides a stable and efficient programming platform that is fast to program and fun to operate. ONYX scales from the smallest shows to the largest touring productions with easy-to-use tools and optimized graphical work environments that can adapt to any task and complexity. Obsidian Control Systems products are distributed exclusively by Elation Professional worldwide and are available in various sizes to accommodate any scale and budget. More information on Obsidian Control Systems and the ONYX platform can be found at www.obsidiancontrol.com.